The challenge here in Tacloban City, to be candid, is trying to find the authentic ingredients for a particular dish you want to make at home. For example, quarter blocks of your favorite and what would be considered as exotic cheeses here will not necessarily be available willy-nilly. The moment it comes in hand though (usually at Robinson's Supermarket), one must seize the op or else lose out on it. While dried Italian seasonings and other herbs can be accessed, the fresh ones are still elusive, unless you are allied with the dealers of the restaurants. 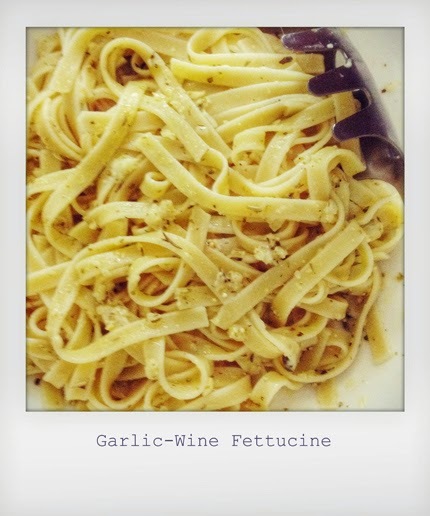 So, about last week, considerable amounts of Parmesan cheese from a block somewhere came to our possession and the husband obliged me with his Garlic Parmesan Fettuccine which he makes so exquisitely and I have terribly missed. I made grilled chicken with my secret dry rub concoction to complement it. It was special, but we shouldn't get spoilt because as I inferred, finding authentic ingredients here can be likened to Indiana Jones looking for archeological artifacts.